My husband and I took off for the beach. However, a sea of fog descended and made it impossible to see the water. So, we decided to take a short trip to Atlantic City and hit the casinos until the fog lifted. I was minding my business playing video poker when an elderly gentleman stood at the machine beside me. Before he got down to the gambling, he took out hand sanitizer and put it on a cloth and wiped the machine completely down. After he finished, with the machine, he applied the same sanitizer to the seat. Upon completing his cleaning ritual, he walked over to a trash bin and threw the cloth away. He came back to his machine, poured more hand sanitizer onto his palms and rubbed them together. I admit that I am not a big germaphobe. I am a believer in frequent hand washing and covering my nose and mouth for a cough or sneeze, and I do carry a small bottle of hand sanitizer in my purse –oh, and I use a paper towel to grab the handle of the ladies room door upon exiting. Hm, now that I think about it, I might be a tad germaphobic, but I don’t wipe down my video poker machine. That goes too far. Yes, there is a chance that I have allowed my imagination to wander. Anyway, do you know that too much hand sanitizer might come back to bite you? Yes, it’s true. According to a new study, those who obsess over using hand sanitizing products might be making themselves drunk. Apparently, this study , conducted at the University of Florida — you know the ex-home of mega-Christian Tim Tebow — found that the hand-sanitizer-crazy-people can test positive for alcohol consumption in some tests – even if they have not consumed any alcoholic beverages. Okay, no panicking. 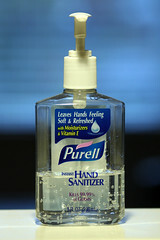 The hand-sanitizer alcohol jump won’t show up in breathalyzer tests or even blood tests that measure recent consumption of alcohol, so Charlie Sheen and Lindsay Lohan or even Mel Gibson probably can’t claim hand sanitizing practices for their run-ins with the law, but those who use hand sanitizers a lot during the day, could register false positives in urine tests which can detect alcohol use for up to five days. So, I guess if one is going on a job interview, which requires testing for alcohol and drug use, one shouldn’t go crazy with the hand sanitizer products for a few days before the interview. The reason for the false positive is that these products are made with ethanol, and the ethanol in the hand sanitizer does get absorbed into the body. So, remember this: Wash your hands regularly, but if there is a chance that you will be going somewhere, where you will be required to hand over your pee, take a break from the hand sanitizer a few days before the event. Hey, I am not judging anyone’s private life, but what goes in your body must come out, and if you don’t want a high alcohol reading, maybe you should leave the Purell at home. Washing the hands is the best, but in a pinch the hand sanitizer works okay. And definitely amazing that this can affect a drug test!! Really funny article! I know a few people who do that. They sanitize everything. My immune system has made it this far in life without needing any help. I’m sure not going to start now. Jack’s right: We have established that alcohol is a good sanitizer and Negra Modelo tastes MUCH better than Purell! But, on a serious note, people are becoming such wimps and hand sanitizers are clear evidence of this. We are destroying our immune sysgtems by never letting them work! That’s good to know… Personally, I use Negra Modelo to sanitize my insides.